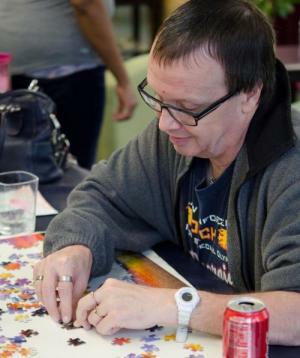 Adults with intellectual and developmental disabilities face new challenges as they age. Activities in our My Turn Senior Program are geared toward maintaining skills and remaining active in an engaging environment. My Turn helps individuals stay in their home of choice longer, delaying institutional levels of living because they have a place to be during the day where they are connected to their friends, the arts and the community. Share and relate past experiences. Participate in age appropriate, as well as intergenerational activities. Participate in crafts and other activities that strive to maintain cognitive and emotional well-being. Learn about healthy lifestyles such as nutrition and exercise. Learn about physical and emotional changes and general aging issues. Experience community outings for educational purposes and to promote active lifestyles. We also offer Respite Care on Saturdays. Learn more here. See more info about our Senior Program in this video. Have questions about My Turn? We're here to help.